If you'd like a giggle at our expense, please check out... The adventures of Pepsi Man! Also Tom's song entry here. And if you have time before 12pm tonight please register and vote us HIGH! ... actually neither of them are! 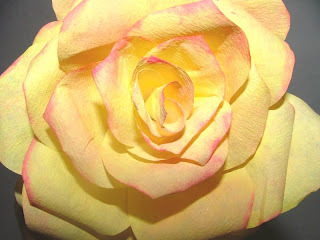 I was web surfing last night and was looking at the Martha Stewart website and found the instructions for making the first rose, I then made the second one. The instructions are here and there is a handy video to watch as well. 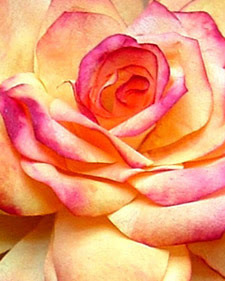 You can also go to the Mommy Makes Roses website for more info. 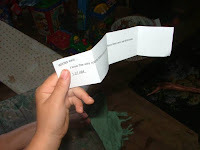 The latest SALT challenge is the theme of WATER as set by my dear sister Esther. 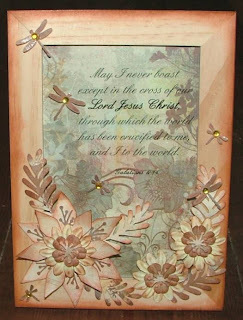 Do have a look at the Faith Challenge Salt blog and the other creations based on this theme. 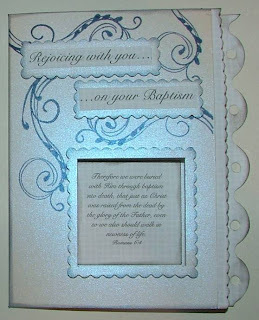 I was short of time this week to do anything too elaborate, so I created this Baptism card. 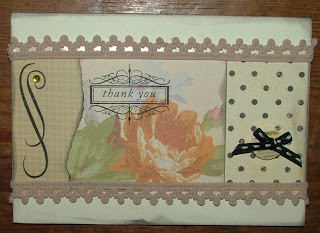 PP by TLC, stamps by Rhonna Farrer, scalloped scissors by Fiskars and the punch tool from MM eyelet setter. 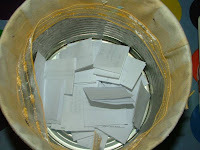 Thank you everyone that took part, I'll let you know when the next blog candy is up for grabs! Just made another one... then really must go to bed, have had far too many late nights. Thought I'd share... bought the first of the Columbo DVD's today. I am no way going to be collecting the whole set, in my opinion you're paying far to much for all the cardboard and paper that goes into the packaging, and the not so researched magazine that goes with it! I'd rather have the disc in a small card sleeve for 99p and be done with it! I love punching the front of cards to reveal a bit of the back of the card, especially if there's pretty paper behind it. 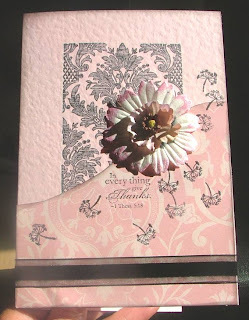 Ingredients: PP by Anna Griffin, Stamps by AG and Rhonna Farrer, Butterfly and Flower punch, Prima Flowers, scallop scissors and Sakura glitter pen. Been making quite a few cards this weekend, it's been easier to find what I need in my more tidy space. Ingredients: Anna Griffin and Do-crafts stamps, flowers from local source and Blooms to Go, large vintage button, ribbon, scrap of newspaper, PP by unknown and leaf punch by Punch Bunch. 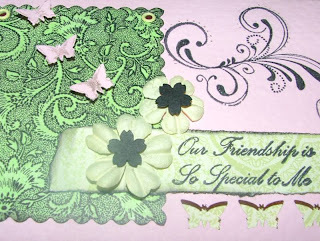 Ingredients: PP by Anna Griffin, stamps by Anna Griffin, Clevercut and Stampin Up. 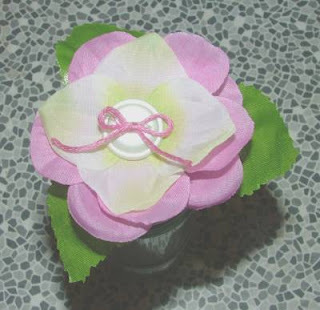 Flower by Blooms to Go and Opitec and some ribbon. Had a go at the Creative Idea on a Sunday challenge of creating something in Black and White and combined it with Wednesday stamper's one of using stitches. 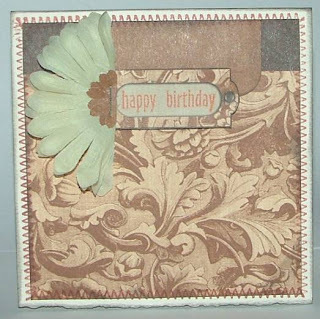 Ingredients: PP by HOTP, stamps by HOTP and Rubber Stampede, Prima flower, vintage button, ribbon and Sakura fine glitter pen. DCM dots and dashes and more sorting! 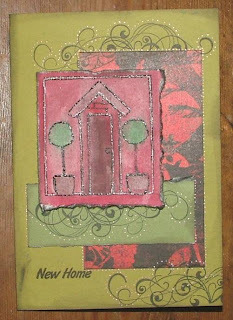 Thought I'd take advantage of my newly sorted papers and card, and actually get back into some card making! 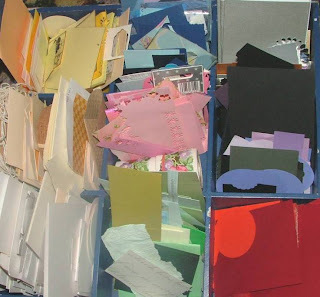 I sorted all my scraps of cardstock and any "cut into" papers into colours sections. Makes it so much easier to find what I need. Just got to keep it that way now and it looks pretty too! Here is my contribution for the latest DCM challenge... While I had bits out thought I'd make a few. Ingredients: PP by TLC and unknown? 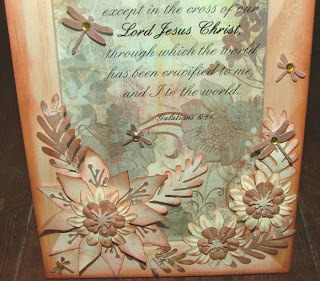 !, computer printed Bible text and sticker by Brenda Walton, Prima flower, vintage button, flower crystal and various ribbons. I know it's a tired cliche but time has flown! I can't believe it's 5 years ago since Luke was born! He doesn't quite understand that it can be your birthday and NOT have a party. So I told him he could invite some friends round to play, have tea and then go to the cinema, which they did. Cooked a vat of Bolgnaise! And a gorgeous chocolate cake, extremely choclatey! Forgot to say the deadline for the entries for the blog candy is Sunday 3pm (GMT) so check back after that to see who won! 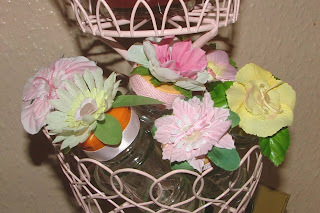 Altered Spice Jars and BLOG CANDY!!! As a treat to myself I bough a wire cake stand from Argos yesterday. I felt I deserved it after doing so much sorting a tidying this week *wink*. I had bought a new spice rack to tidy up kitchen area and had spice jars left over that I want to put small craft bits into. They were crying out to be altered, so I stuck flowers and ribbon onto the lids so that when they're in the stand it looks like a posie of flowers. 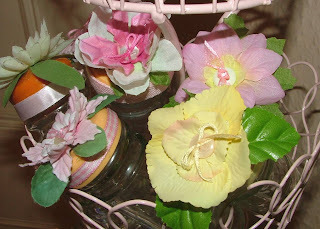 Ingredients: Empty spice jars, glye gun, assorted fabric flowers from stash bought from general stores and charity shops, buttons, ribbon and emboidery thread. And as a treat to you, leave a comment on this post telling me your ideas for what I should store in the jars and I will enter your name in the draw for the jar below. 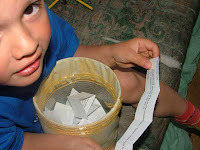 Not only will you win the jar, but tell me your favourite colour or colours and I'll fill it with candy such as ribbons, fibres, button and anything else that takes my fancy! So get your thinking caps on and post me a comment. International bloggers welcome! Made this for a friend, sketch taken from Sketch This blog. 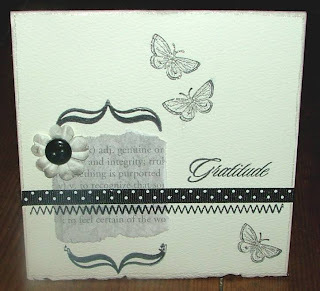 Ingredients: PP by Basic Grey, Stamps by HOTP and Create-it. 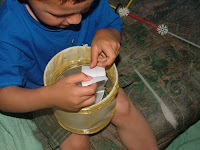 Found another challenge blog today, I just love them! So inspirational. I got this sketch from Marie loves to Stamp, I had to make this thank you card for a lovely couple who phoned me when I had left my purse on their stall today! They tracked my number in the phone book and were trying to contact me all day. Ingredients: PP by TLC, DCWV and Brenda Walton. Stamps by HOTP. Old lace, button, crystal and ribbon from stash. My DH has entered a Pepsi competition, he composed a song, then filmed himself singing and playing the guitar. ... please take a look HERE and rate it accordingly. You'll need to register to cast your vote. 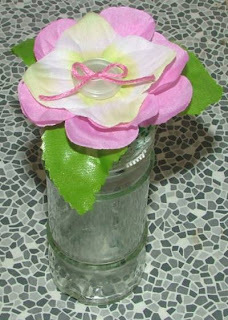 Ingredients: PP and stamps by HOTP, silk flower from a general store and flower punch. Wooohoo I'm pleased to annunce the 2nd challenge from this exciting group and fab group of ladies. I was thinking along the lines of how my life is FULL in CHRIST. I have chosen the theme "Life to the Full." This theme comes from the verse John 10:10b where Jesus says that He has come so we may have life and have it to the full (or in abundance)! "Life to the full- in Christ" means for you. You can do it whatever format you like e.g. A Layout, card, beyond the page, canvas etc. That it is because of Jesus that my life is complete. I was searching for a verse to express this and came across a verse I was given just after my baptism. I have often pondered on it and what it means and how it should affect my life. 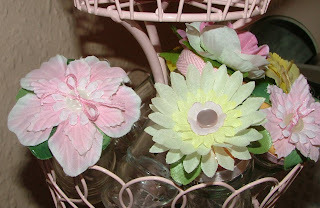 The flowers have been inspired by the work of Carole Janson and others who create 3D paper flowers. 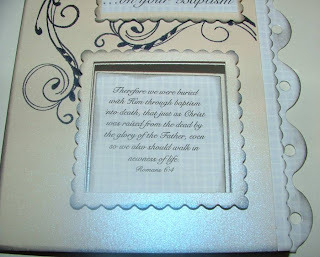 The verse is printed on acetate, the frame lightly inked and then the flowers, leaves and dragonflies stuck on with sticky pads or Modge Podge glue. The dragonflies have little crystals on them and coloured with a clear gel pen to give them a shine. 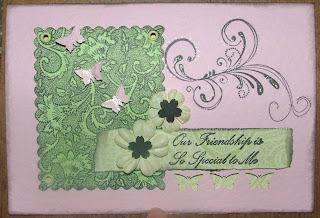 Ingredients: PP by Basic Grey, flowers by Prima, Leaf and stamen punches by Leone Em, Dragonfly punches by Woodware and Xcut. Made this on Sunday, and have finally blogged it! Have been frantically sorting out boxes I've not looked at for months/years and rearranging bedrooms, as we are now the proud owners of bunkbeds! My craft stuff is slowly being ordered, have yet to tackle the 12x12 paper! Now, here's a question, do you sort into order of colour, manufacturer, theme? 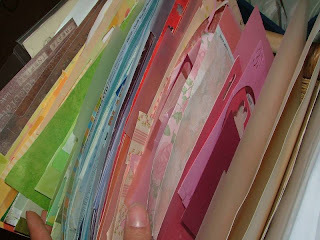 I've sorted my little pieces of card into colour order and it is fab! So easy when making a card to find what I need! 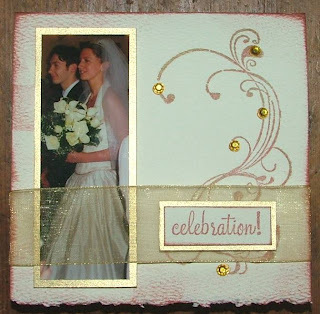 Anyway, here is the card, hope the couple who's anniversary it was last month, and who I'll be sending it to doesn't check this blog soon! 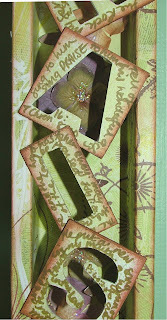 Ingredients: Stamps by HTP and Rhonna Farrer, organza ribbon rescued from some packaging and some crystals. While the whim is taking me, I'm taking advantage of it! Been doing a long overdue sort through of craft stuff, and I've just scratched the surface!!! 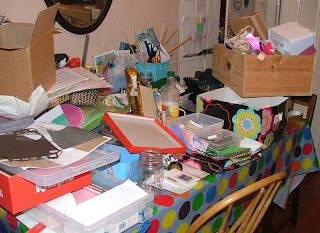 I am a self confessed horder and need to sort it out! Off course I had to make my sorting look pretty. So I got round to using my Kilner jars for what I intended them for. I have picked up quite a number of them from jumble sales and wanted to use them for storing titbits. and here is my dining table!!! As you can see, not quite there yet! 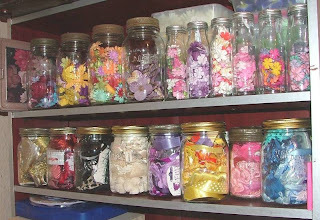 How do you organise your craft stuff? By items, colours, themes? Any tips would be most valued. 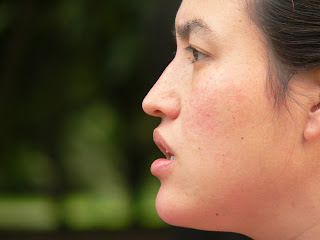 A friend of mine took the following pics of me, and asked if I minded it being posted on Facebook. I was intrigued as to why he wanted my permission, but when I looked at it I knew why. Although it is not what I would regard as a flattering picture of myself it is an honest one. I find it hard to look at as its a view of myself I don't often have. When we see ourselves it tends to be in a mirror, and I was quite shocked when I was younger to realise that I don't really like my profile. I've learnt to tolerate it now. Praise the Lord! We have got back from a week at the Carey Family Conference. We are shattered but happy. 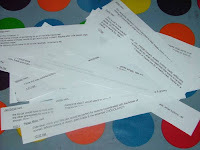 Thought I'd better update my blog with my involvement with the Salt Faith Challenge blog. I am so privledged to be involved with an international and inspirational group of women. The response so far has been wonderful and I am aiming to have a good look at what people have been creating. However, as soon as I've posted this I must head for bed! 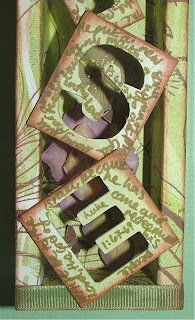 Here are the pics of my Altered box on the theme of Praise for Salt. 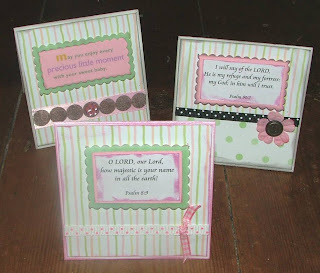 On each letter is written a verse of the Bible containing the word PRAISE. 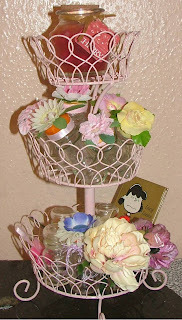 Ingredients: PP by Basic Grey, Prima Flowers, butterfly punch (2 sizes), Modge Podge, ribbon, glitter glue and a wooden box. In the form of a challenge site! SALT is now up and running, a challenge craft site that gives us the opporunity to express our love for God, and to use the gifts he has given us through the means of art and craft. 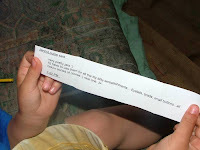 All welcome to join in with the Bi-weekly challenges, visit www.saltfaithchallenge.blogspot.com for more details and to check out the project that I made!